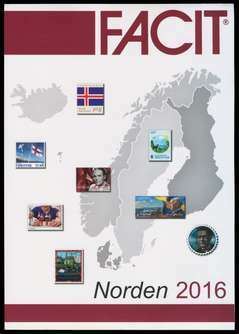 Facit 2016 NORDEN (Simplified before 1950, Specialized 1950 onward) (Facit Norden 2016) Starting 2016 Facit has been divided. This NORDEN does include pre-1950 stamps, but only in simplified form (similar to Scott, but including all major Facit numbers). After 1949 the listings are specialized just as they were in the previous editions. 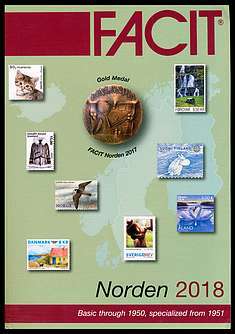 SPECIAL SECTIONS: Sweden FDC collecting illus., Sweden MODERN POSTAL FORGERIES LISTING (pg 239); Denmark machine stamps; Iceland revenues, postal stationery. 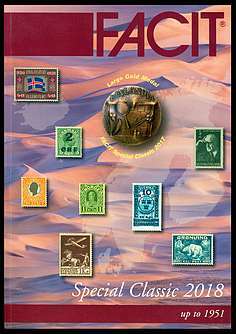 Otherwise, all usual stamp, booklet, machine stamp, FDC, etc., listings are present. IN COLOR, with ENGLISH TEXT. WAS $79.00. SALE! 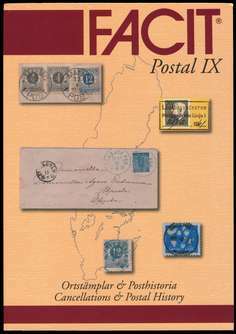 Facit Swedish Postal History / Cancellation Catalog VIII (2009) (Facit, 2009; Facit Postal VIII Ortstamplar & Posthistoria) This is the primary priced catalog and handbook for postmarks, including town, railway, ship, rural, military, foreign, pre-stamp, etc. Also includes extensive postal rate charts (the most useful reference). Important pre-stamp postal history section, and postal label section. Now includes PERFINS with pricing for stamps and covers! Greatly expanded with many price increases. Rural cancels are expanded (now including rectangular cancels); Military cancels expanded, now with pricing of Postanstalten cancels! ; and much improved railway cancel listings. Includes REVERSE ALPHABETICAL TOWN NAME INDEX. This is THE must-have reference for cancel and cover collectors. WAS $84.50.